All of our collections come with coverage by us, Kristie & Brenden Woods. Full Edited Film plus a Mini Online Film for sharing & Raw Footage. Prices are based on 8 hours of coverage – more or less coverage is available. Please contact us for more detailed pricing. We keep our team small as to not overwhelm or be in the way of the moments that are unfolding. We love to capture photography & video together, telling your story in two creative styles. However we are happy to offer solo packages as well. Be in the moment, enjoy every second of your wedding day… great advice for sure! However, your day will be filled with so much joy & excitement that it will seem to fly by. Your photographs and video will be your only lasting visual memory – and we always suggest you put your favourite images in a wedding album that will last forever. 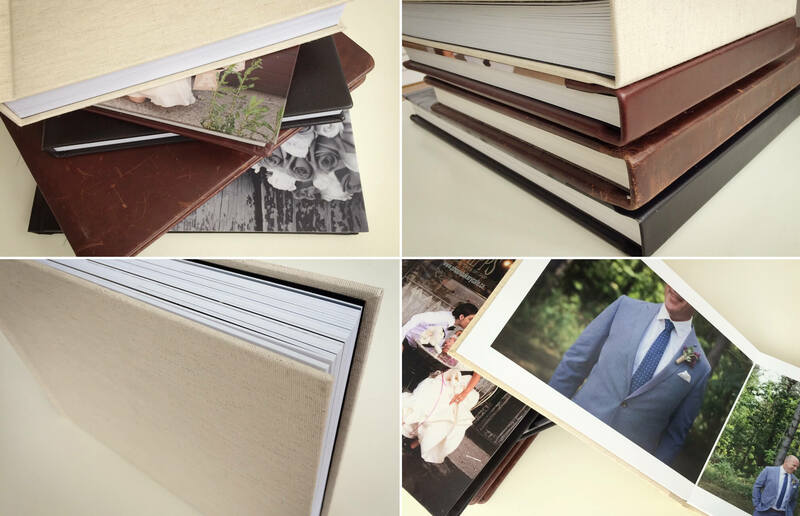 Our Fine Art Layflat Albums are handmade in Toronto and designed by us! These albums have thin sturdy pages, the book opens flat and the photographs spread across the pages with no gutter. There are a variety of cover options- photo, leather and canvas.